The NEW Daily Decision for 10.29.18 - How Low Can It Go? | Marketfy or install Google Chrome Frame to experience this site. The NEW Daily Decision for 10.29.18 - How Low Can It Go? Are we having fun yet? To be sure, the recent stock market correction has created some angst as the bears have knocked -7.55% off the DJIA, -9.63% off the S&P 500, -12.60% off the NASDAQ Composite, -12.86% from the Mid-cap index, and -15.69% from the Russell 2000 small-cap index. So, as they like to say on TV, most of the major indices are definitely in "correction territory." However, the fact that the market corrected should not have come as a surprise to readers of this oftentimes meandering morning market missive. For example, back in July and August I began emphasizing the point that many of my favorite long-term market models were not in their happy places and that "risk was elevated." And I am pleased to report that we did take some precautionary measures in various portfolio strategies to take both the beta and the exposure of the portfolios down a notch or two. However, it is important to remember whilst patting one's self on the back that taking defensive measures is only half the battle! The next trick is to identify when the coast is clear and to attempt to benefit from the pullback. Which brings us to the title of this week's macro market missive: How Low Can It Go? Obviously, this is a tricky subject. And to review, I don't run portfolios based on my view or make market calls. No, on that note, I prefer to stick to the weight of the evidence from my major market models. 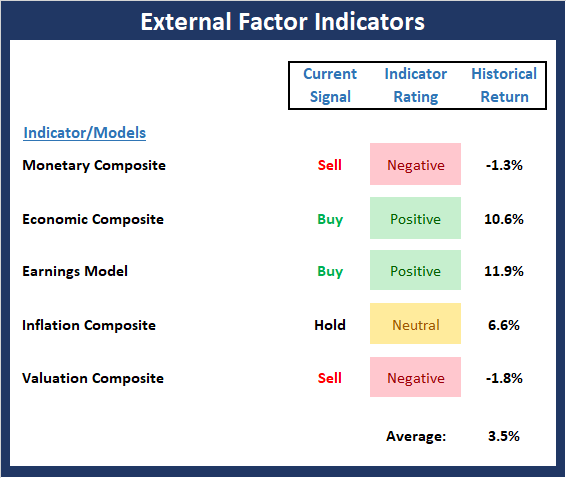 However, experience has taught me that it can be tough to pull the trigger when the indicators tell you to take action - especially during emotional markets. Thus, having some sort of clue as to how far the bears could take things during times like these can help one prepare. So this morning, I thought it would be good to review the history of cyclical bear market declines in various environments. To be clear, I don't know that we are currently in a cyclical, or what I like to call a "mini," bear market. And I do not see any evidence that the current secular bull is ending. However, I will admit that there is a decent chance that there may be some additional downside to endure. And as such, I'd like to get a feel for how much more selling to prepare for. So here goes. If let's look back at all the bear markets since 1900. Ned Davis Research tells me that there have been 36 bear markets to review. And so that we are all on the same page, a cyclical bear market is defined here as either a 30% drop in the DJIA after 50 calendar days or a 13% decline after 145 calendar days. Looking at the bear markets as a whole, the average decline has been -30.6% and the median has been -26.0%. However, both the economic and secular backdrop at the time bears occurred makes an BIG difference! For example, during secular bear phases (secular trends tend to last many years and contain multiple cyclical bulls and bears), of which there have 22 cases, the average decline has been -36.3%. But, during the 14 secular bull markets that have occurred since 1900, the average decline of a "cyclical bear" is -21.8% and the median is -19.0%. Currently, I believe the stock market is in the midst of a secular bull phase, which began on March 9, 2009. So, we can take solace in the fact that bear markets that occur during a secular bull are much shorter and shallower than average. In addition, we can look at the damage the bears are able to inflict given the economic environment. I.E. Whether or not the U.S. economy is in recession. NDR's computers tell us that since 1960, the bear markets that occurred in association with a recession in the U.S., have produced an average decline of -30.5%. But when the bears attacked without the U.S. being in recession, the 10 declines averaged -22.9%. More recently, the last two cyclical bears occurred without an accompanying recession. In 2011, the fear over Greece and the U.S. debt downgrade produced a decline of -16.8% on the DJIA. And in 2015/16, the fear over China created a decline of -14.5%. So, given that the Dow is currently down -7.6% and the S&P is off -9.6%, recent history suggest that the decline is at least half over. Assuming the current dance to the downside turns into a cyclical bear, that is. The key here is that if you have cash put aside and the bears do take hold here, one strategy would be to start deploying capital into any further downside action. 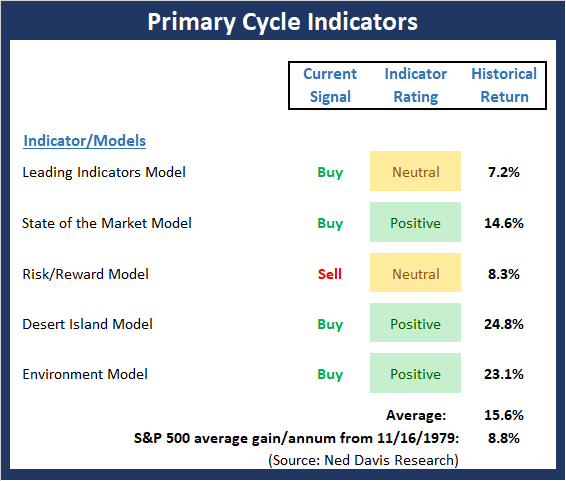 The Primary Cycle board did a good job of alerting us to the fact that the odds of a correction were elevated - well before the current nastiness began. However, the model seems to be sending a different message now. So, unless the models weaken in the next month, my takeaway is that the current decline will wind up in the "correction" category as opposed to the "bear" camp. But time will tell here and we shall see. This week's mean percentage score of my 5 favorite models pulled back a bit to 62.0 (from 64.0%) while the median held at 70% (also from 70%). 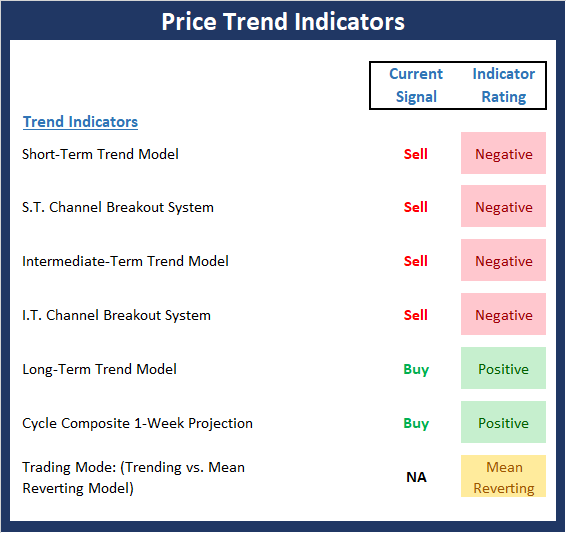 To no one's surprise, the Trend board remains negative to start the week. However, the good news is the cycle composite points higher this week and reminds us that favorable seasonality is just around the corner. It is also important to remember that the long-term trend model remains positive. The Momentum board remains an ugly sight to behold. The key here is there has been enough technical damage done that the bottom will likely be a process as opposed to an event. But then again, if we get good news on trade or Powell says the words "data dependent," things could change in a hurry. 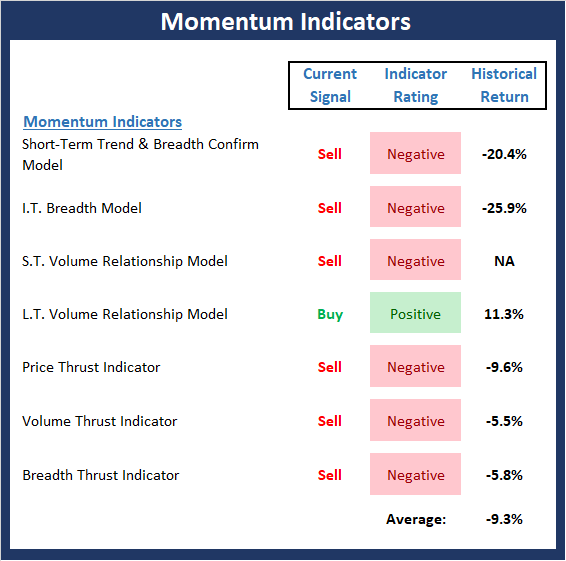 The "Early Warning" board, which, again did a great job of alerting us to the fact that the table had been set for the bears, now suggests that important oversold levels are being achieved. And the next "bounce" will likely be an important "tell" about what comes next from an intermediate-term trend perspective. Analysts are fond of saying that the fundamental backdrop remains solid. By this, my guess is most are referring to the state of the economy and corporate earnings. However, when one looks beyond earnings, things become less encouraging. So, as I've been saying, this board reminds us that risk factors are elevated. 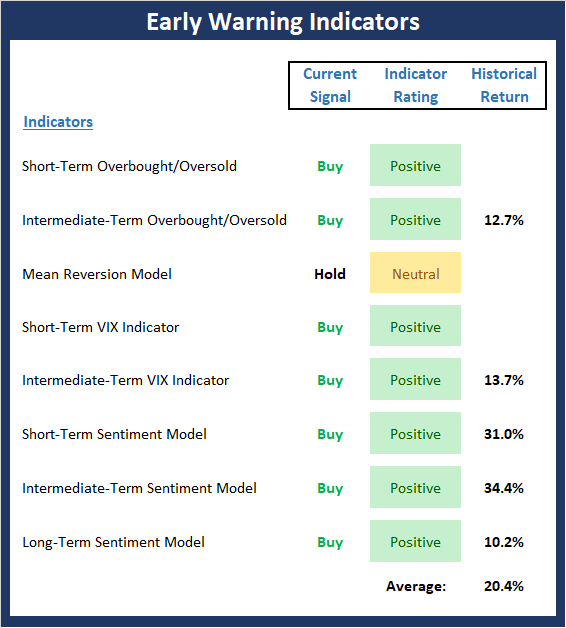 At the time of publication, the editors hold long positions in the following securities mentioned: SSO, QLD, XLK, XLY, XLV, AAPL, MSFT, AMZN, TGT, ABT, BA, WM, V - Note that positions may change at any time.